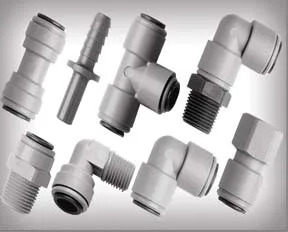 Bee Valve offers Push-In Fittings for a range of tube connection applications. The grey acetal body fittings, with Nitrile rubber O-rings, are available with a full range of sizes and configurations. They can be used with polyethylene, polyurethane, polypropylene, and nylon tube. The fitting design offers quick and convenient tube assembly. Bee Valve is a manufacturer of low-pressure fluid control and handling products, offering a complete line of ball valves, couplers, adapters, strainers and fittings; as well as gaskets, clamps, gauges and sealants.